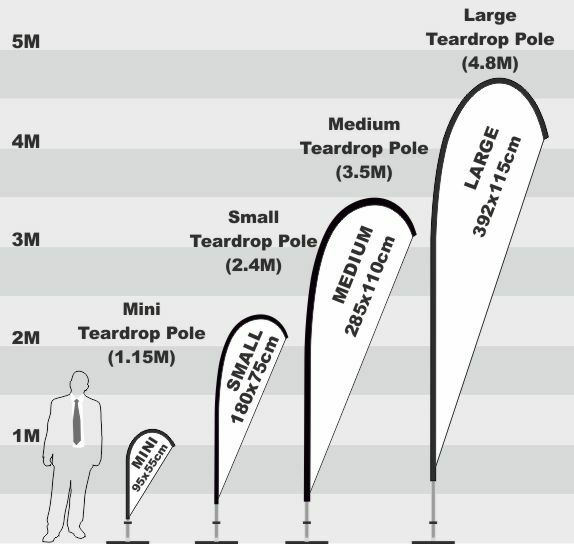 All our Teardrop Flag kits include the Teardrop Flag, Flag Pole and Ground Spike in a standard Carry Bag and most important there are No additional fees for custom artwork. All our kits offer an excellent way to advertise your company and the products you sell. Our kits are light, yet strong, simple to erect and we offer a 1 Year Manufacturing Defects Warranty on the Poles and 1 Year Manufacturing Defects Warranty on the Bases. In addition we do not charge for any artwork fees or set up fees. Buying our banner kits ensures the best value for money in Australia. We strive to give you the best quality at the best price and throw in the best service in Australia.